As Centre County continues to grow in population and visitors, so too do its transportation infrastructure needs. That includes University Park Airport, which currently boards more than 140,000 passengers annually and is home to increasing number of commercial flights. To help meet that growing demand, the airport is embarking on a $9 million improvement project to address access and parking needs. Airport, Penn State, PennDOT and government officials gathered on Wednesday to discuss the planned improvements, which are being funded by a combination of a grant from the state's Multimodal Transportation Fund and a low-interest loan from the Pennsylvania Infrastructure Bank. The project will include a new, longer public access road to the airport terminal, added parking, a bus terminal and a new stormwater management facility. A $2.2 million state grant, awarded in May, will fund the new access road. The entrance to the airport will be relocated further down on Fox Hill Road, creating an intersection with Alexander Drive just past the FedEx center. James Meyer, executive director of the Centre County Airport Authority, said that the current, shorter access road has seen increased congestion because of factors such as the growth of Uber and Lyft as well as an increase in flights, with two planes sometimes arriving at the same time. "This is an extended road that will help us take care of the congestion issues that we’ve been dealing with," Meyer said. "It just ends up being gridlocked out front because we’re trying to deal with too many vehicles with that limited space we have." A new kiosk will be built at the end of the parking lot, letting vehicles out onto a loop road and then onto Fox Hill Drive. The current exit will be closed. Meyer said a new bus station will be added near the terminal as well, with a canopied area for passengers boarding and exiting. It will have room to stage two additional buses as well. An additional parking lot with space for 330 vehicles will be added. Along with the addition of new ADA parking spaces, parking will increase by 70 percent, from the current 624 spaces to 1,060 spaces. Parking has been at a premium as the number of flights and passengers have increased. Gone are the days of turbo prop flights that carried a handful of passengers, too. Meyer said that as of Christmas Day 2017, University Park has been an all-jet airport. In October alone, United Airlines will increase its flights to Chicago from three to four each weekday, with five flights on Saturday and Sunday. Flights to Washington Dulles will increase from two to three per day. That means for the month of October, an increase of 5,000 passengers, Meyer said. "It shows what a new destination city can give you," he added. "Chicago service just started four years ago and we have grown to this point this coming month. It’s been a great destination city and very popular." A new stormwater management facility also will be constructed -- on property purchased 13 years ago with that purpose in mind -- and the existing stormwater ponds in front of the terminal will be closed. 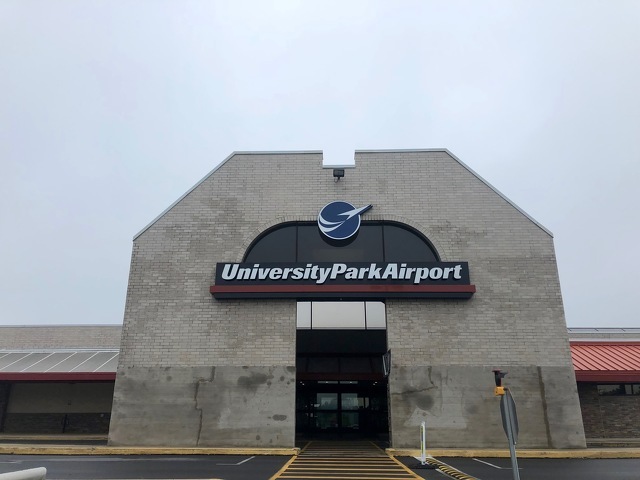 Bryan Rodgers, airport director, said the most recent PennDOT study found University Park Airport has $200 million in economic impact, and that investments in improvements, will help ensure "University Park Airport continues to be a positive economic force within our community." Anthony McCloskey, PennDOT Bureau of Aviation director, said the $2.2 million grant and more than $7 million PIB loan are investments in quality of life and economic development. Zack Moore, Penn State vice president for government and community relations, said that for a national university with global ties, Centre County's geographic isolation can be challenging. He said that transportation infrastructure improvements over the past 20 years "have been nothing short of astounding, citing work on I-99, Route 322 and plans for the airport and the new I-80/I-99 high speed interchange. "Infrastructure is critical to the current and future success of Penn State and the entire Centre Region," Moore said. State Senate Majority Leader Jake Corman, who was a major advocate for the airport funding, among other transportation projects, credited the vision of local leaders and Airport Authority board members over the past four decades for helping the airport to grow to its current demand. "The fact that we’re the sixth busiest airport in the state and we’re clearly not the sixth largest community in the state really shows all the hard work that’s been done over the years be people with vision," he said. Corman said he and others still hope to see a direct spur from I-99 to the airport, and airport officials said the future may include addition of a second level to the terminal. "This isn’t the end. This is the continued growth of this community and this facility… It’s an exciting day and hopefully one of many to come," Corman said. 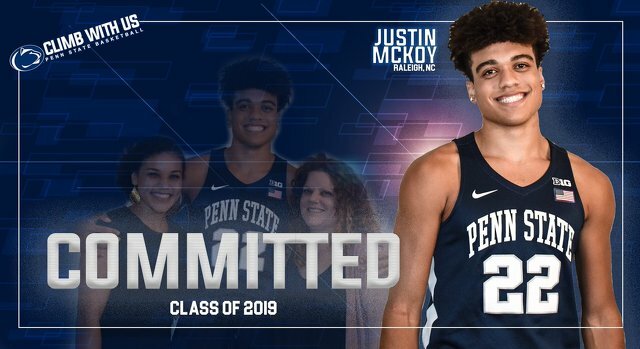 Penn State men’s basketball got its third commit of the 2019 class on Wednesday when Justin McKoy decided on the Nittany Lions. The small forward is unrated and had offers from 14 mid-majors, as well as Kansas State, per 247Sports.